It's little more than a decade since Mark Zuckerberg dropped out of Harvard at the age of 19 to launch Facebook. The social network has made him the fourth-richest man in America and a hero to any aspiring college entrepreneur. "There's been a massive shift," says Derrick Maggard, director of the Apex Systems Center for Innovation and Entrepreneurship at Virginia Tech. "Most of these students grew up during the great recession and saw their parents, maybe their grandparents or an aunt or uncle struggle and get laid off by large companies. "They're almost fearful to go into the corporate world," Maggard said. "They say, I don't want that to happen to me - I want to do my own thing and control my destiny." "Ideas are a dime a dozen and there is nothing in the world that somebody hasn't already thought of. It really comes down to the ability to execute an idea and that is a really difficult process," he says. 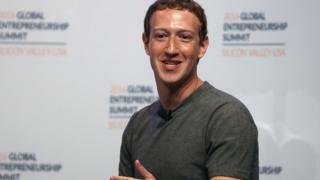 Mark Zuckerberg is now worth more than $52bn (39bn), adding $18bn to his fortune in the last year alone according to Forbes. And while he represents a tiny percentage of entrepreneurs, many other successful companies have been started in a college dorm room. Dyn was co-founded in 2001 by Jeremy Hitchcock, studying at Worcester Polytechnic Institute, Massachusetts. He developed a way to optimise the flow of data between online companies and their users to improve internet performance. Dyn, based in Manchester, New Hampshire, now employs 400 people and boasts clients such as Twitter and Etsy. "I'd give the same advice to any university student," says Hitchcock. "Go start a company or be part of something where you're creating or building, because you're at a time in life when you have that freedom of exploration. And do something that's crazy, that's non-traditional." Maggard says there is no better place for experimentation than a college campus where students can also develop professional networks. "If you are a student entrepreneur and you have an idea with a time limit on getting it to market, I would encourage you to take a leave of absence and give it a go. But those are rare," he says. "Work on it while you're in school. Develop the idea and continue to do customer research. Then when the time is right and you are ready to move forward, go for it." But, she says, attitudes towards women entrepreneurs are changing. "If I know my investment is safer with a person who is going to consider all the options and then make a move, that's a (good) investment strategy." She says millennials - particularly women - also have a different definition of success and are better at identifying work-life balance. "They are much more sophisticated in looking beyond their current state and saying, this is the way I'd like my life and my work to be. They don't want to be part of the 50 percent winding up in divorce court like their parents," she says. Maggard agrees that the new generation of college entrepreneurs have ambitions that go beyond making big bucks. "A lot of our students are coming to do research to solve really big problems," says Maggard. "They're thinking about things in a way that will allow them to make a difference in the world. We have this social entrepreneurship and social impact culture and it's very cool. "We just have to surround them with the right mentors, the right tools and the resources so they can be successful."